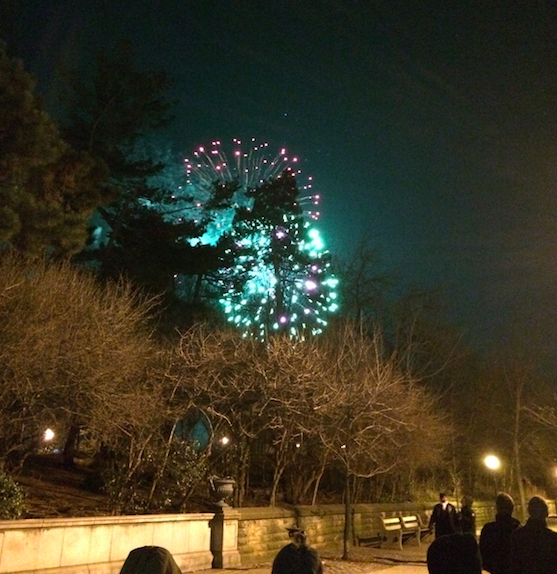 As it’s been our tradition the last few years, we gathered with dear friends, neighbors and perfect strangers to watch the explosions in the sky over Prospect Park – Brooklyn’s version of the ball drop. It was a fine show on a cold and clear end-of-year night, but it wasn’t punctuated with that powerful punch of chaotic bursts. Slightly disappointed, the chilly onlookers began heading back to their homes, but just as we’d turned our backs on the park, the sky erupted with a burst of pops and flares – a delayed, but no less daring grand finale to the year. Just when we thought it was over it wasn’t – there was still some magic left to be had. I thought that a fitting way to end 2104, a year heavy with loss, a year which reminded me to be more conscious about remaining open the good surprises and unexpected delights, too. Wishing all clarity, brightness and magic when you least expect it in 2015. This entry was posted in create, Uncategorized and tagged 2015, Brooklyn, fireworks, happy new year, New York, prospect park by lhouse. Bookmark the permalink.